After the impressive first showcase of the Samsung S8 and S8+ in New York, a selection of journalists had a chance to go hands-on with the new phone, along with speaking with representatives from Samsung. After almost an hour with the devices, I have to say I was impressed and may need to jump aboard the Samsung S8 hype train, at least for a few stops. The first thing I noticed when I picked up the S8 was the design and how inspired it was. In the past, it could be argued that Samsung devices have a very derivative look. They often felt like a mish mash of other designs focus-grouped into one device. With the most recent batch of devices—the S6 onward—they moved beyond that, building something new and fun to use and look at. With this latest device, they outdid themselves. The S8 is stunning, and possibly one of the best-looking phones currently able to be purchased in North America. The bright curved edge screen is vibrant and clear. The new 5.8-inch S8 is the perfect fit for your hand. Using it felt fluid and comfortable. I was skeptical towards the edge style screen being the only option, but after using this model, I have to say I am a convert. This is a much better use of screen real estate than the single edge seen on past phones and oddly works perfectly on the near bezel-less display. The S8+ on the other hand with its 6.2-inch screen offering was perfect for media consumers. It was not too big and still fit right in your hand as well. It’s not the size for everyone, but if you like a big phone, this is one of the most comfortable I have ever used. Speaking of that lack of bezel, I was one of the most prominent skeptics of the concept when I first saw it at the Unpacked event. It sounded like a gimmick far more than something that would be useful to people. While I don’t think all phones should emulate this concept moving forward, it looks jaw dropping on Samsung’s new flagship. The lack of bezel makes movies and media pop, feeling much more like a minuscule TV screen. But, while the bezel on the sides is fully gone, there is still space made at the top and bottom of the device for the required cameras and microphones/speakers. With that being said, these never get in the way and do not take away from the overall aesthetic look of the device. The one downside is the new placement of the fingerprint sensor. It has been moved to the back of the phone beside the camera. This may not sound like that big of a deal; there are plenty of phones with rear sensors, in fact, it often works better than on the front. It is the odd choice to place it right beside the camera that feels weird in use. It very well could become second nature with some real world testing, in the short demo session it never quite felt natural. In a smart move, Samsung has left the 3.5mm headphone jack intact, despite some rumours to the contrary. They are even throwing in a set of AKG headphones that are fantastic and could run upwards of $100USD if picked up separately. The S8 and S8+ also come with Bluetooth 5.0, so even if you want to go wireless, Samsung has you covered. The phones will even allow up to two people listening via Bluetooth simultaneously, and that is ideal for anyone used to travelling with someone, or who just want to share songs with a friend. To help with this your music listening and photo taking Samsung has the ability to expand the storage for up to an extra 250GB via micro-SD card. No word if it will be able to expand beyond that point at this time. 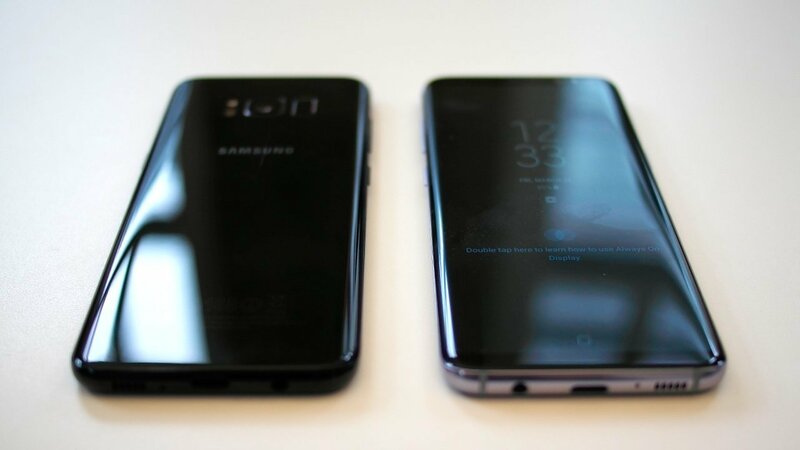 Samsung has also removed the physical buttons to aid in the near all screen design. They have opted for on-screen buttons with light rubble to ensure you know where you are pressing. They worked flawlessly in testing, and within a few minutes, I had forgotten that was ever an issue. Again, it remains to be seen how these will function when faced with everyday use, but overall I am happy with what I see on this front so far. The back camera on the phone, for the most part, remains the same as last year’s offering, the S7, but the front camera has received a spec bump. Moving the camera from a 5MP to an 8MP autofocus camera makes the S8 and S8+ a real selfie powerhouse. The camera app even comes equip with Snapchat style filters so you can live out your fantasy of being an odd human-dog hybrid. Software wise the S8 and S8+ feel reminiscent of past Samsung offerings. There have been many areas of refinement, along with a few new features, but if you have owned an Android or a Samsung device in the past, you will quickly feel at home with the new line of flagships. The interface felt fast and fluid overall. There is a level of fit and finish on the S8 that makes it a joy to use. Samsung has apparently taken cues from past devices, along with the competition and built something that is a principle of refinement for them. It felt much less bloated than other offerings, and the new additions do not feel tacked on, so much as needed parts of the experience. There are two notable additions to the S8 that make it exciting; the first is Bixby. 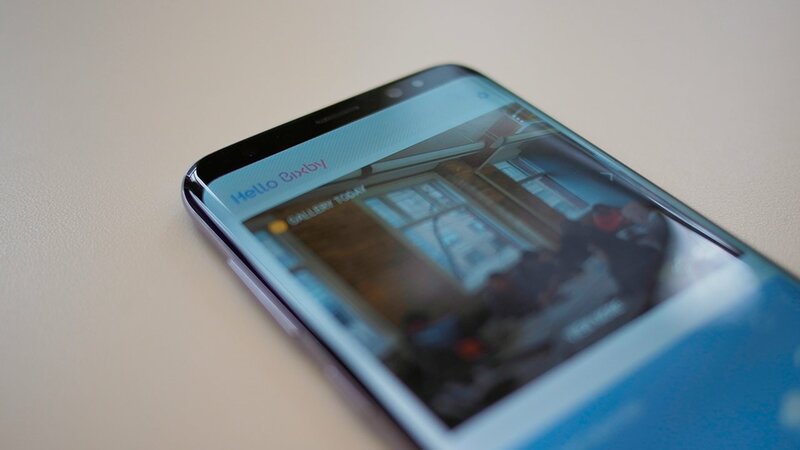 Much like other virtual assistants, it gives basic access to the functions of the system such as note taking, reminders, emails, etc., but Bixby is poised to be more of a phone assistant than a replacement for Google or Siri. That being said, there base work is in place to make Bixby more impressive, Samsung will just need to build the app integration and instructor to make it a reality. As it is now, it seems to be a fun tool to use, and has a dedicated button on hand to take full advantage of it. The next, and possibly more impressive feature is named Dex. 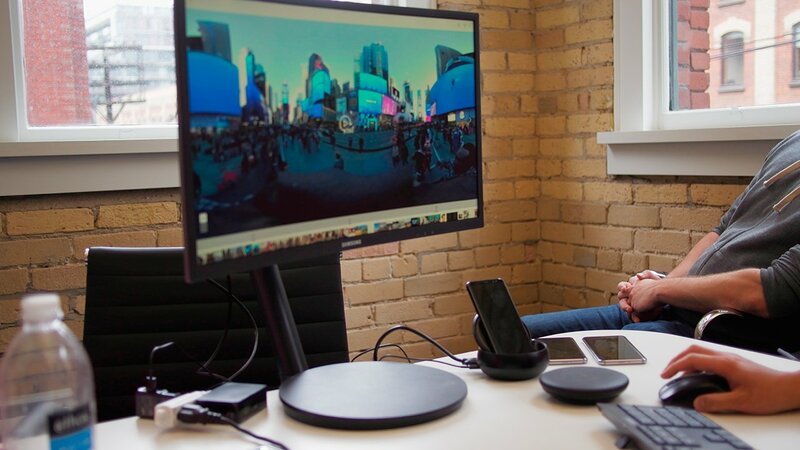 With the help of a separate doc, an S8 or S8+ user will be able to connect your phone up to a monitor, Keyboard and mouse to achieve a near full desktop like environments. Much like other offerings such as Continuum on Windows Phone, Dex will use the power of the device and the Qualcomm Snapdragon 835 chip to allow true multitasking with a Chromebook like an interface. All your apps and utilities work in windows in the mode, and overall things felt useful. It is going to be hard to sort out a real world use case for Dex, but in concept it is exciting, and something I want to try and fit into my workflow. At the end of the day, the S8 and S8+ are stunning pieces of technology. They feel good in the hand, are powerful and are packed with all the latest features you could hope for. The screen is stunning, the built is solid, and it overall is an amazing device. It will need to be put though its paces to get a feel for it. We will have out full review closer to the April 21 launch, but until then I have to say it is one of the most impressive offerings of 2017 so far.